We mentioned earlier this week that a new brewpub is set to open next month in the hamlet of Hensonville, near Windham. Hammo’s Brewpub & Lodge front desk manager Katie Fields shared some details about the new venue, which is scheduled to debut Aug. 15. The restaurant, brewery and inn, which take their name from the nickname of owner Gordon Hamilton, are located in the former Horton Smith House, an 1865 building on Goshen Road. The kitchen and brewing operations are headed by Fields’ husband, Ryan, who “has been cooking since he was 14,” Katie Fields said. Ryan Fields began home-brewing beer about six years ago, taking over the couple’s Schenectady kitchen making beer for friends and family, she said. In February, the couple relocated to Greene County after answering a Craigslist ad for a brewer and chef. “This has just been a dream come true for us,” Katie Fields said. The brewery will offer seven beers at opening: a black IPA, an imperial amber, a blonde ale, a double blonde ale, an American stout, a West Coast-style IPA and a pale wheat. Greene County is becoming a hotbed of Catskills beer. Windham’s Cave Mountain Brewing Company and Crossroads Brewery in Athens have loyal followings. Hammo’s is the second new brewery to open in Greene County this summer: Angela’s Pizzeria in Catskill launched its beer operation last month under the direction of master brewer Nat Collins, who co-founded the TAP New York festival held at Hunter Mountain each spring. A Greene County Beverage Trail is also in the works. Statewide, the craft brewing industry grew 59 percent from 2013 to 2014, according to Gov. Andrew Cuomo’s office, and 207 craft breweries now call the Empire State home. The 1865 building has been revamped into dog-friendly lodgings, a New American restaurant and a brewery. Photo courtesy of Hammo’s. At Hammo’s, the beer will be paired with hearty offerings from the kitchen. The restaurant’s menu (PDF) features a selection of traditional pub food such as wings, burgers and salads, and also includes raw oysters and clams. There are five diverse riffs on macaroni and cheese ($6-$8) and five varieties of flatbreads ($7-$9). Larger entrees include skirt steak and chicken and biscuits, and run $10 to $15. The restaurant also has a full bar permit and will serve cocktails and wine. 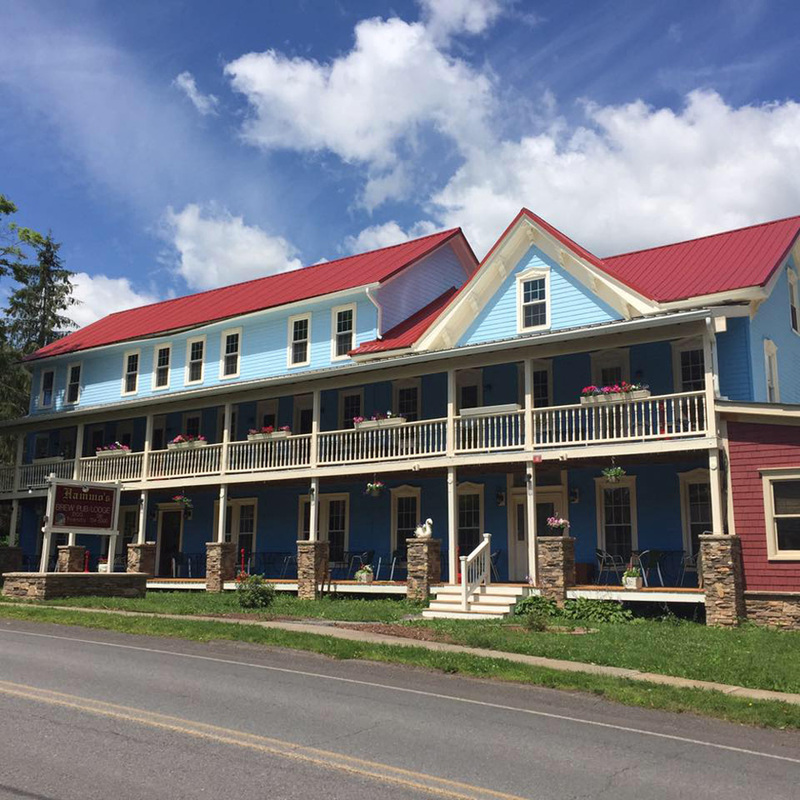 On the lodging side, there are 12 rooms opening for guests next month on the second floor of the inn. Each has its own bathroom and either double and queen beds. The third floor is still being renovated, but will eventually have 10 hostel-style rooms, with shared bathrooms. Hammo’s will also host weddings. One cool amenity: the inn welcomes canine companions. It’s so dog-friendly, in fact, that it offers a 5 percent discount for guests who bring their dogs, Fields said. “Our owner really loves dogs,” she said. 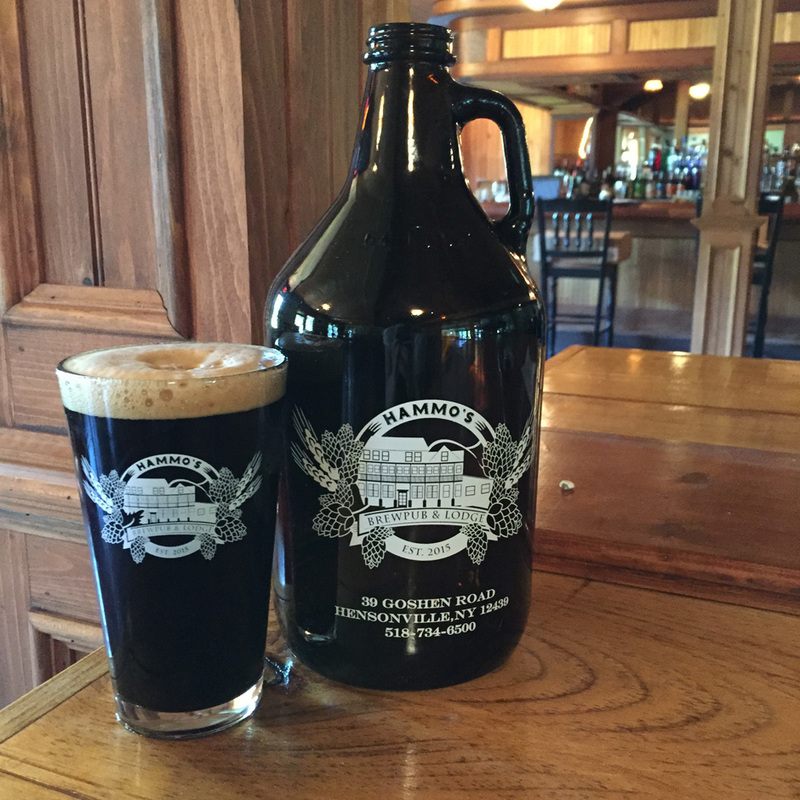 Find Hammo’s Brewpub & Lodge at 39 Goshen Road, Hensonville, and on Facebook. Hotel reservations are accepted by phone at 518-734-6500.